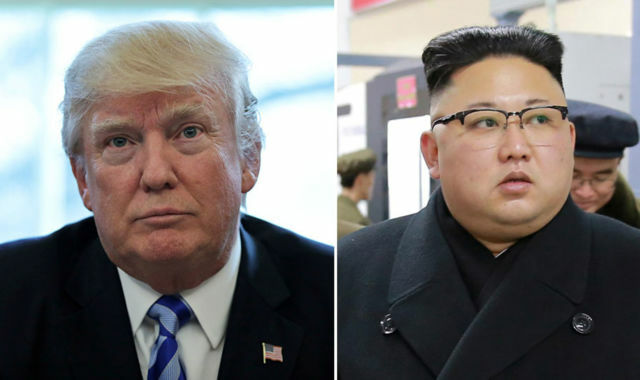 Forget Brexit, forget Russia, the potential conflict with North Korea is what we really should be worried about, says David Mellor. In this crazy spring, I keep thinking we haven’t got our priorities right. As we focus so intently on perhaps the most predictable election since WWII; one which makes Foot v Thatcher in 1983 seem like a really close call; as we fret about a bloke with knives in Parliament Square, we could actually be on the brink of a nuclear war. Okay, maybe not one right next door, but one where the consequences would be felt here in terms of nuclear contamination, and very quickly. The situation in the Korean peninsula right now is perilous, it really is. Kim Jong Un is a power crazed megalomaniac. His one interest in life is creating the capability to nuke the US, and his neighbours. There’s nothing much else to do in that putrid place, so he also has a huge army and lots of conventional weapons, capable of creating a lot of damage without using nukes at all. We know he has nuclear weaponry, but we don’t know how sophisticated his capability to deliver them is. But one thing is certain – he’s working on it, and getting better at it, every passing day. Which is why Donald Trump and his top military brass are so worried. And though it pains me to say so, they are right. Trump may be a buffoon in so much of what he says and does. And Obama may have been infinitely more intellectually gifted, and sophisticated than Trump. But Obama’s foreign policy was a miserable failure. He did nothing to curb Kim’s excesses, and bequeathed a situation in the Korean peninsula to his successor that is simply unsustainable. So Trump has decided to face Kim down. The consequences could be helpful – Kim could step back – but I wouldn’t bet the ranch on it. Trump is willing to risk it all ending catastrophically, because he figures that the potential catastrophe can only get worse, the longer he leaves it. So far, Trump has done surprisingly well. He challenged the Chinese publically that they needed to tackle Kim, with whom they share a 1,000 mile border, through which Kim gets most of his goods and services. In that sense, North Korea is a client state of the Chinese. The risk Trump ran, having thrown down the gauntlet to President Xi, is that the Chinese would react against it. They haven’t. And following that meeting in Florida - plus all the chocolate cake and Trump's grandchild singing a Chinese song to the President - President Xi is singing back a more attractive melody than Trump could ever have expected. They are not telling the Americans to get their tanks off Kim’s lawn. And they are, apparently, telling Kim not to carry out a further nuclear test. But this is still nail-biting stuff. A lot of the Brexit chat that dominates our lives is actually self-indulgent rubbish, on a par with the kind of insults that husbands and wives trade on the steps of the divorce court. This is different. This is for real. This is the nearest we have got to nuclear exchanges since Cuba. I lived through the Cuban missile crisis, and remember it extremely well. Lots of people thought the world was on the edge of a nuclear holocaust, and then Khrushchev blinked, and stepped back. Is Kim willing to play Khrushchev? That’s the big question. And there’s no shortage of people who think he’s so steeped in megalomania, the kind of logical decision Khrushchev took, may well be beyond him. We will learn the answer in the next few weeks. And I wouldn’t even rule out a preemptive strike from North Korea on the South. Thank you for letting me detain you with this. Please feel free now to return to all that maundering rubbish about Brexit. But try to remember, compared to this, Brexit is a sideshow.